This time of year it’s traditional to try to stop bad habits and start good ones. In the workplace, there’s one habit of which almost every employee is guilty, regardless of your industry, job title or location: Excessive emailing. There’s no better time than the start of the New Year to rethink your relationship with email. 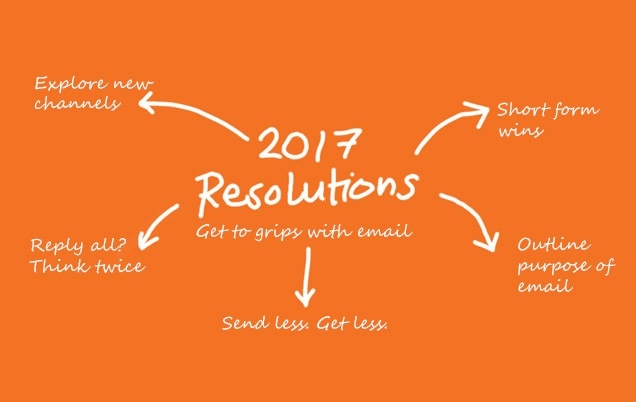 With a little discipline and fresh thinking on how you communicate, your 2017 self could be more productive, decisive and efficient. And that sounds like a job promotion. could save lots of time and avoid any embarrassing opportunities for things to get lost in translation. Millennials especially, please take note! Minimize the number of recipients per email. Copying a lot of people into a message can be seen as a lazy way to cover your own back. Just email those who really need to know, and resist the temptation of adding a bunch of names in the ‘cc’ field. 3. Reply all – not! When there are multiple recipients, it’s tempting to use the default “reply all.” But again, be disciplined about who you reply to. It’s highly likely that you only need to reply to the original sender, and not “All Staff” – as one staff member recently did at a 9,000 employee organization, causing havoc. Another time killer is the trailing tentacles of a long and boring email thread. Delete the stuff that’s not relevant to the key topic when you’re forwarding on a message. Emails with open-ended questions often remain unanswered. Avoid sending messages asking, “your thoughts?” These tend to fall into the “too-hard tray,” and simply get ignored. Or, the respondent is forced to spend an inordinate amount of time carefully crafting his/her opinion. 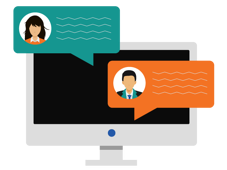 Check whether your question would be better dealt with in person or using a collaboration channel so that everyone has equal input. If it has to be by email, suggest possible solutions within the body of your email to help with decision-making and get a better response to your message. With a little effort, everybody can improve their email etiquette. Always proof-read before pressing send. Keep emails short, treat the subject line as a headline so the recipient can determine if the message is relevant, and present a clear purpose for why you’re sending the email and what actions are required. Be forthright and resist the typically feminine trait of over-apologizing in your message. In the spirit of improving habits for 2017, now’s a good time to explore other communication channels proven to drive high message cut-through, response rates and employee input. Increasingly, organizations are deploying a range of tools (such as collaboration platforms and push messaging systems) to suit different internal communication needs. One size no longer fits all. To sum it up, email overload is a major factor in today’s broken communication, draining almost $1.5 trillion a year in the US alone. Start the New Year by rethinking how you use email. And encourage your colleagues to do the same!